A signed and dated print from an original painting by Robert Toth. This picture represents the home and studio of John F. Peto in Island heights, New Jersey. 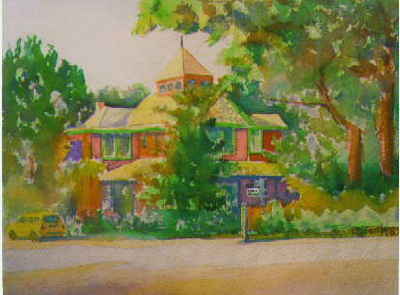 Peto built his Queen Anne style house and studio at 102 Cedar Street, Island Heights in 1890. The house, with its hipped roof, dormers, tower and gables, was home for hlm, his studio and family. Peto was a late 19th century still life painter who specialized in the trompe-l'oeil (fool the eye) style. This motif became the trademark of the American trompe-l'oeil school of painting during the period.